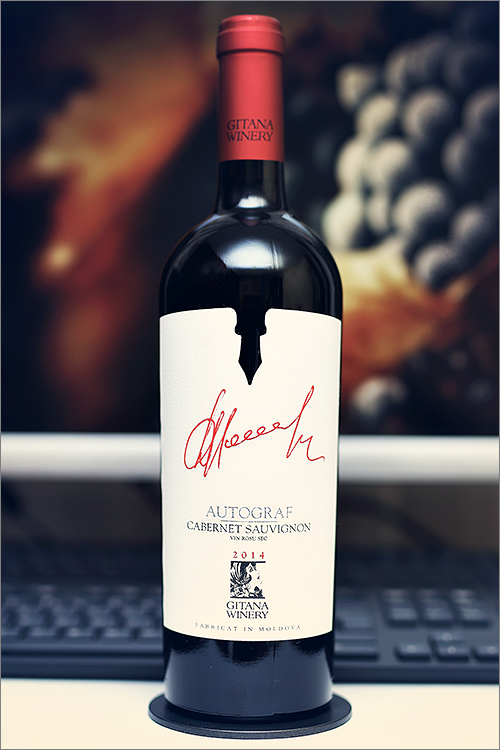 Tonight we are going to review another cabernet sauvignon wine – the king amongst the reds and the world’s most popular grape variety – Autograf Cabernet Sauvignon 2014 from Gitana Winery. Cabernet sauvignon is a late ripening variety, the progeny of cabernet franc and sauvignon blanc and is the most planted grape variety of any colour, grown all over the world in a wide range of climates, yet it does particularly well in the warmer regions, due to its late ripening character. One can find many good to very good cabernet sauvignon wines almost in every wine-producing country and Moldova is no exception. The wine we are reviewing tonight is part of the ‘Autograf’ collection, made of four single varietal wines, each of them bearing the signature of one of the owners – the Dulgher family. That said, let’s move on, straight to the tasting! Deep garnet color, not too deep, with purple and indigo hues towards the rim of the glass. The nose is strong, filled mostly with sweet and overripe black fruits: black cherry, blue plum, blackberry, wildberry, black mulberry jam, blackcurrant, sour cherry, blackberry jam, blueberry, blackcurrant jam, black mulberry and ripe figs. An instant later the nose is filled with elegant notes of medium roasted oakwood, leather, cherry tree wood, nutmeg, violets and some hints of rooibos tea. The wine is dry, with high alcohol level, high acidity and ripe tannin. It feels bold, complex and expressive, with a nuanced new world fruity accent. This is a quite nuanced, leathery and seedy wine, as it tastes a bit woody, ripe and quite tannic. It feels just a bit off the balance, as it lacks harmony and elegance between all its elements, which leads to an angular yet quite supple mouthfeel. It has a medium-plus finish and an balanced, velvety but seedy aftertaste. This is definitely a fine Wine of Moldova and the overall rating says the same, with 90.7 points scored it is right there, among the best wines we’ve tasted so far. Please click on the chart icon on the left in order to get to the wine rating page, where you can find all the wines we’ve tasted to date. Conclusion: this is a wine on the rise, that has yet to reach its prime form. It has plenty of tannic grip on the palate, with a touch of alcoholic warmth showing through. We would recommend to keep it for the next 2-3 years or thereabout uncorked. The wine feels a bit angular and unpolished at this stage, as it lacks some harmony and roundness, yet has a quite promising ageing potential due to its nuanced tannins and mouth-watering acidity. Pair this wine with meaty dishes with rich umami flavour, like for example a seared medium-rare steak or a charcuterie and cheese board, so that the wine’s angularity will be enriched by the meat’s umami flavours. Cheers!